Search and find out online from our exclusive collection of imported quality products in Pakistan 5-Port Switch with IR Remote, AC Adapter and 3D Support by Portta from the category of Selector Switch Boxes that is available to you at low price in Pakistan. It is multi-functional on switching and is support HDMI 1.3b. Support highest video resolution 1080p. This 5-Port Switch with IR Remote, AC Adapter and 3D Support High performance up to 2.5Gbps and also assists to uncompressed audio such as LPCM. It also support 12bit per channel and support 3D and DTS Digital, Dolby Digital in case of audio. 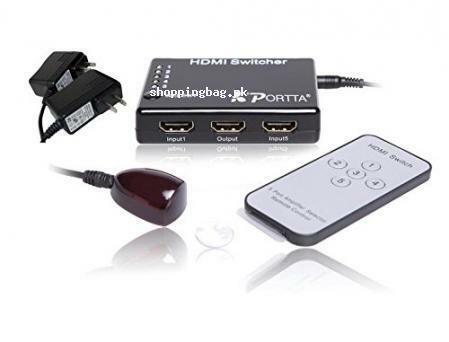 Explore more from our online shopping in Pakistan at low price in Pakistan such as; PORTTA PET0301S 3x1 Port HDMI Switch/Switcher 1080P Supports 3D with IR Wireless Remote Ultra, OTG Hub, HooToo Charging Station 40W 7.8A USB Travel Charger AC 100 - 240V 4 Port Access, Portta WSPETVHP VGA Plus 3.5mm Audio to HDMI Mini Converter Adapter for HDTV 1080P and many others. Grab it right to your locale with no shipping charges in Pakistan and enjoy online shopping of imported quality products in Pakistan. Multifunctional on switching : intelligent or mechanical Support HDMI 1.3b. Support highest video resolution 1080p.